This design was adapted from a simple Danish papercut. However, the original post and rail bridge was changed to a stone bridge with wrought iron railings since these were more easily interpreted on canvas with original blackwork treatments (all reversible). The bare tree is executed in Appleton crewel yarns, using softly shaded stem stitch rows that form lovely curves on canvas without splitting the canvas threads. A bird feeder done in composite stitches hangs from one limb, and a variety of birds are hovering for a special treat. 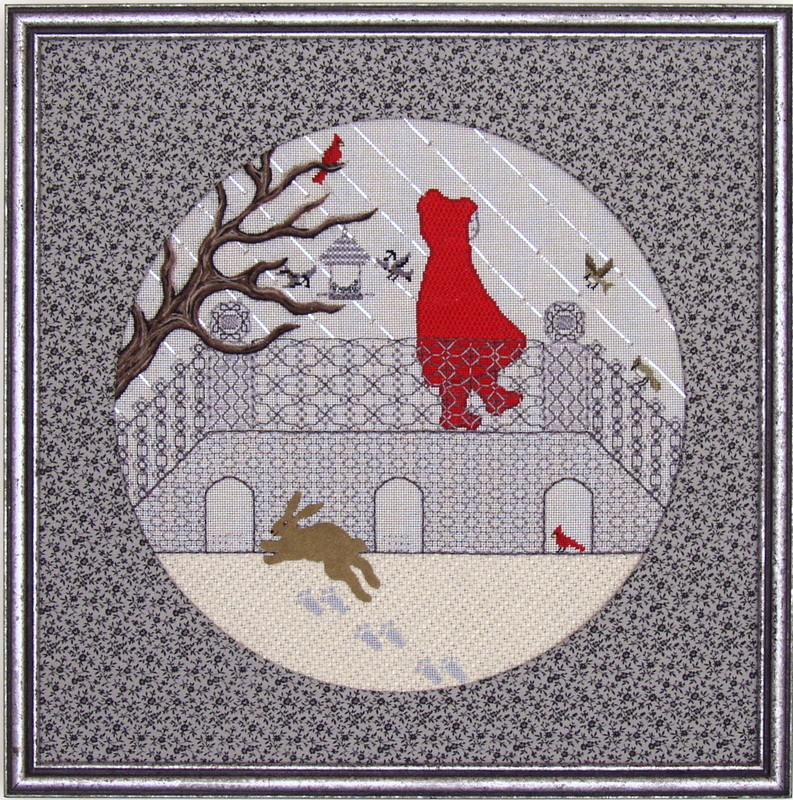 A frisky rabbit, done in padded ultrasuede applique, is scampering across the snow, which shows his Marlitt footprints in the open composite pattern used to simulate snow. The sleet is suggested with woven rows of synthetic silver plate with beads at the ends to similate ice. The figure on the bridge is wearing an appropriate raincoat with galoshes. He is shown here in red with corresponding cardinals, but alternate color choices for the accent color include blue with matching bluejays or yellow with evening grosbeaks. The figure itself must be stitched prior to class since the blackwork railing must be superimposed on to a completed background in class. Therefore a mail-ahead packet will be sent to each student as soon as the class list and the color choices are received. The threads used are mostly DMC floss and pearl cotton along with the Appleton crewel and synthetic plate mentioned earlier. There are also accents of Kreinik metallics in both pearl and pewter, some Marlitt in the footprints, and some Medici crewel for the snow pattern. COLOR CHOICE: Only for the boy's slicker and the birds. Model is stitched in red with cardinals. Alternatives include a blue slicker with bluejays or a yellow slicker with evening grosbeaks. PREWORK: The bridge must be outlined in back stitches and the figure must be stitched. Estimated time: 8-10 hours. 1. To discuss ways to adapt from non-embroidered sources. 2. To teach a style of realistic shading with random rows of a line stitch (e.g. the stem outline on the tree limb). 3. To teach reversible blackwork technique with special emphasis on shading with superimposed layers, using two values as well as two compatible patterns together. 4. To introduce methods to cut and mount kid and ultrasuede applique's (e.g. rabbit). 5. To discuss landscapes in general on canvas: stylized ways to achieve atmosphere, perspective, texture, shading, etc. TEACHER PROVIDES: All materials needed to execute the design, a colored photograph, the mail-ahead segment and a detailed instruction booklet. STUDENT PROVIDES: A 14" stretcher frame along with 2 HiLiter pens for marking charts, a laying tool, and cuticle scissors. Other embroidery staples needed are embroidery scissors, a clamp or weight to secure the frame to the table, and a lamp and/or magnifier, if needed, along with an extension cord.